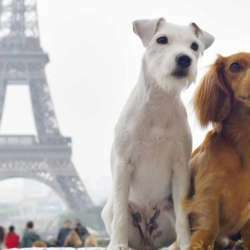 You must be a member of the Paris Dog Club Group to attend this activity. Would you like to join this group? Let's start this year walking our puppies in an unusual place. The island is lined with many benches and more than Protected content . At its downstream end, a modest bronze replica of the Statue of Liberty 16 meters high emerges from the viaduct Passy, which interrupts the course of this walk. Thé Statue of Liberty was commissioned by Frédéric Auguste Bartholdi ( Protected content ), and was donated by the Committee of the Paris Colony of the United States in thanks for the one given by France to the city of New York. Plenty of water for your dog. Snow boots are recommended to avoid slipping. 3. Feel free to invite your friends who love dogs, just make sure they sign up on InterNations first. 4. You can come without dog but you love them. 5. This walk may be cancelled due to bad weather but I will keep everyone informed. 6. Please, cancel your attendance if you change your mind, so there is room for others who wish to join. 7. Feel free to text me if you have any questions.